Summary: This is a list of frequently asked questions about the Windows PowerShell 2011 Scripting Games. Microsoft Scripting Guy, Ed Wilson, here. The prep work for the 2011 Scripting Games is nearly complete. All the events are written and in the hands of the expert commentators. I was so happy that I was compelled to send a tweet and make a posting to the FAN page on Facebook. The following image shows the posting I made on Facebook. Here are some of the questions about the Games that I saw last year via Facebook, Twitter, and scripter@microsoft.com. 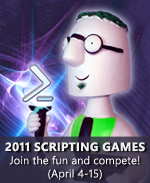 The Windows PowerShell 2011 Scripting Games sound really cool. How do I sign up? Sign up is easy. Coming soon you will just go to the 2011 Scripting Games page on the PoshCode site. Create your user name, and add your email address. Keep in mind that your user name will appear on the leader board (so do not choose something that you would be embarrassed for your mother to see). The email address is used for notification of prizes from our daily drawings. Both the user name and the email address are used at the end of the Games for sending out the valuable 2011 Scripting Games certificates. I just realized I have 7 days to submit my script for an event. I would like to add some things to my script, but I do not see a way to recall or delete my entry. You are right. There is not a recall or a delete function. When a script is submitted, it cannot be changed, deleted, or recalled. Make sure that the script you want to have graded is the script you submit. I am getting tired of browsing to review the scripts submitted on PoshCode. Is there a way to search for scripts? Yes. In the upper right corner next to Login/Profile, there is a text box. Type search terms there, and press ENTER. I am not on the leaderboard, but I submitted my script. What’s up with that? The leaderboard report runs at midnight Pacific Time, and if you submit your script later than that, it will be counted in the next day’s leaderboard. Also, keep in mind that we are not listing anonymous submissions on the leaderboard. I tried to upload my script, but it is not working. What’s going on? There are bound to be a few challenges along the way. Keep trying. We are updating the status on the on Twitter and on the Scripting Guys Facebook group. If we do not have a note there that says the system is down, you should let us know about it by Twitter. The tag for the 2011 Scripting Games on Twitter is #2011sg, and we are filtering for that. If you do not include that tag, we will miss your tweet. The cool thing is that you can also filter for #2011sg and catch up with everything that is going on. You may also want to filter for @ScriptingGuys and #PowerShell. I am unhappy with my standing in the Games. What can I do? We suggest that you pay attention to the grading guidelines (you can find them via the 2011 Scripting Games: All Links on One Page site. A basic script that meets the needs of the scenario will get two stars. That is a good score for the Games. Nevertheless, if you add additional things (for example, error handling and comments), you will gain additional points. Keep in mind that this year, you are only allowed to compete in one category—either Beginner or Advanced. Therefore, it is important to submit excellent scripts for each of the ten events. You guys are posting stuff several times a day on your blog. How do I keep up with everything? I sympathize with you! Last year, we published more than 160 pages in conjunction with the 2010 Scripting Games. I do not intend to publish that many pages this year, but to date I have already published 11 pages related to the Games, and the 2011 Scripting Games are still three weeks away! Use the 2011 Scripting Games tag on our blog. It will bring up everything. In addition, the All Links on One Page site provides the essentials such as links to each event and to PoshCode. However, if you only use that page, you might miss some of the other cool things going on.